Chlamydosaurus kingii also referred to as frilled lizards and frilled dragons are amazing reptiles. They are bipedal and have a beautiful frill around their neck that reminds me of a prehistoric Dilophosaurus. These may not be the most commonly seen pet reptile, but that is no excuse to overlook the proper care of these exotic creatures. Chlamydosaurus kingii is largely arboreal, spending the majority of the time in the trees. Adult enclosure should be 1.2-1.8 meters tall x 0.8 meters deep x 1.5 meters long (4-6 x 2.5 x 5 feet) especially for keeping a pair or trio. Juveniles should be kept in at least an aquarium type enclosure similar to that of a 20gal tall (0.6 x 0.3 x 0.4 meters (2 x 1 x 1.2 feet)), screen enclosures can work, but humidity will need to be adjusted. No need for hide boxes, but plenty of vertical horizontal and diagonal branches of varying diameters to choose from. Reptile bark substrate or combination of organic potting soil, play sand and coco fiber(coir). Basking temp under heat light 46 ºC (115 ºF). Intense UVB lighting is a must for these lizards, follow manufacturer’s instructions. Daytime ambient temps 29-32 ºC (85-90 ºF). Nighttime temperature 24-26 ºC (75-80 ºF). A shallow water pan may be used for added humidity and possible defecation, but daily misting are a must. 70% with frequent misting for babies/juveniles up to 3 times a day, adults 1 to 2 times a day. Mainly insectivorous diet, should include crickets, hornworms, roaches, superworms, soldier fly larvae, grasshoppers. All prey items should be dusted with a good quality calcium/D3 supplement daily, and reptile vitamins once a week. The occasional appropriate sized mouse may also be offered as a treat. They may also ingest a bit of salad including greens and various fruits at times, start offering when the lizard is young if possible. Some dragons especially when exposed to human interaction when young, will do just fine with regular handling, while others will display signs of stress, please do not force a new personality on to your dragon, enjoy hand feeding or tong feeding your lizard and their interesting behaviors if they do not feel comfortable outside of their comfort zone. Enclosure should be checked daily with a simple spot cleaning and a with a natural substrate the enclosure may need only complete breakdown every 4-6 months. With proper humidity and regular spraying your dragon should have no problem shedding, you may also give the dragons a soak in the bath or a shower during this time to help along in the shedding process or to bathe your dragon. 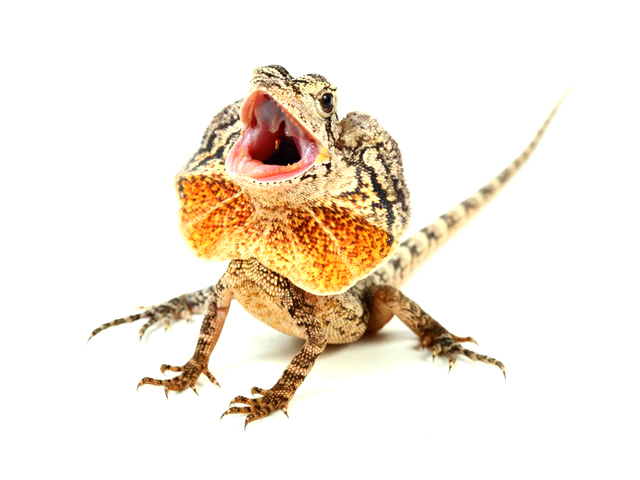 Parasites are always a concern between imported lizards and lizards fed live prey items, so if you notice strong smelling stools, see worms in the stools, or decreased appetite, lethargy, weight loss, please take a stool sample to a vet right away. Shedding issues and burns on the top of the frill are quite common on adult dragons, so keep an eye on proper humidity and make sure ambient enclosure temperatures are quite high so that they do not sit under the heat light for extended times.